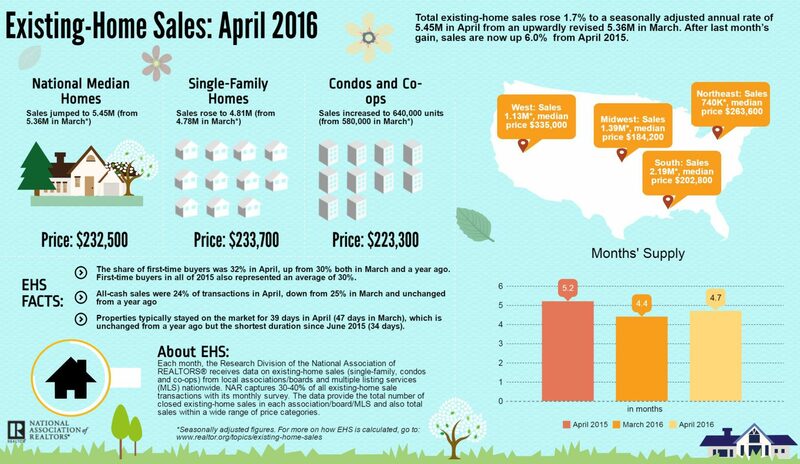 April's existing-home sales held onto their momentum for the second month in a row. In addition, total housing inventory rose by 9.2 percent to 2.14 million but is still down from a year ago. Sales surged in the Midwest and also experienced a significant increase in the Northeast, while the West and South saw modest declines. Strapped inventory and elevated prices haven’t kept winter’s hibernating buyers from breaking into the spring 2016 seller’s market. April’s existing-home sales held onto their momentum for the second month in a row, according to a recent report by the National Association of Realtors. Sales surged in the Midwest and also experienced a significant increase in the Northeast. Sales surged in the Midwest and also experienced a significant increase in the Northeast. Taking into account single-family homes, townhomes, condos and co-ops, existing-home sales grew 1.7 percent to a seasonally adjusted annual rate of 5.45 million, compared to an upwardly revised 5.36 million in March. In addition, total housing inventory rose by 9.2 percent to 2.14 million. While this demonstrates progress, the number of available homes for sale remains 3.6 percent lower than it did in April 2015 (2.22 million). NAR: In the West, supply shortages and stark price growth are hampering buyers the most. With the median existing-home price across housing categories rising to $232,500 in April, an increase of 6.3 percent from the same time last year, the market is also experiencing its 50th consecutive month of year-over-year price gains. On average, properties stayed on the market for 39 days during the month of April, a number that’s level with days-on-market one year ago, and down from 47 days in March. Nearly half (45 percent) of homes were on the market for less than a month in April — the fastest turnaround the market has experienced since June 2015. “The temporary relief from mortgage rates currently near three-year lows has helped preserve housing affordability this spring, but there’s growing concern a number of buyers will be unable to find homes at affordable prices if wages don’t rise and price growth doesn’t slow,” Yun added. “Secretary Castro’s update that the condo rule changes are in their final stages before implementation received great applause from Realtors both at the forum and throughout the country,” said NAR President Tom Salomone. “To ensure that purchasing a condo increasingly becomes a viable and affordable option for first-time buyers, NAR supports the ongoing efforts to eliminate unnecessary barriers holding back condo sales.